I decided to make this bed in response to the gopher raid of 2016. The gophers ate EVERYTHING I planted except a few turnips, and my onions and garlic. And my strawberries. I did get a few tomatoes from my crop, but not enough to can everything I wanted. So, I'm fighting back this year. 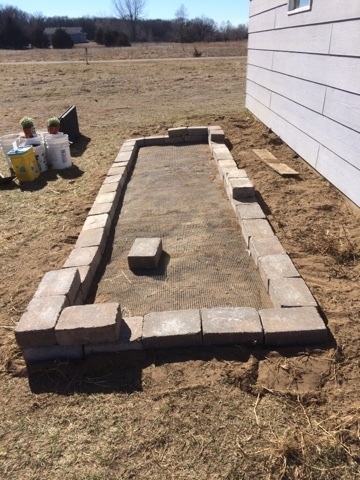 I decided to put hardware cloth under a raised bed of bricks. There are exactly 114 bricks in this bed and next time I think I will use wood. But, I love the look of this since it's right out in the open area. 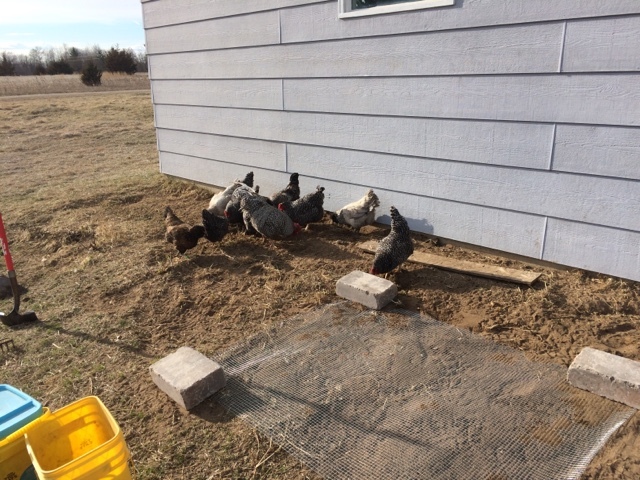 My chickens loved helping me flatten it out and look for bugs as the same time. You can see my soil quality isn't that good so a raised bed takes care of that problem as well. Although I have not had gophers in this exact spot...I don't put it past them to find my goodies after they are planted. I used 3 of these sections of wire since I couldn't find any length of it anywhere in my area. The bed ended up being just a bit wider than 4 feet and about 13 feet long. I have pretty long arms and I will be able to reach in from either side to plant, weed, till, or harvest. You can also see my new cold frame in the back left of these photos. I'm excited to get moving on this in 2017! Here is the bed almost finished. 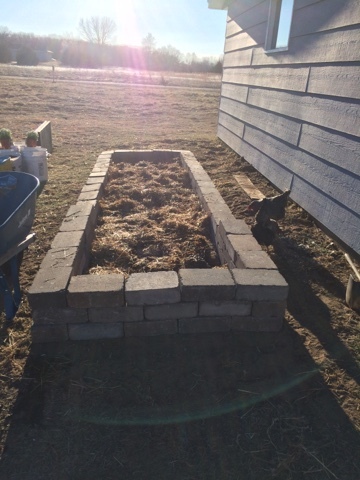 I think I had to pick up the last of the blocks, I put some old straw in the bottom to help hold in moisture and provide a bit of composting action too. As soon as it is all filled I am going to plant a few things in there for spring. I may end up having to lay a piece of wire across the bed to keep deer from eating all my greens, but we will see. What are you planning to garden for 2017?? 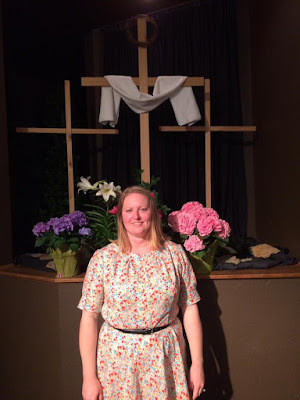 This year I decided to make my Easter dress at home, since I haven't been able to find things that fit me too well in styles that I like at the stores. What's going on with fashion right now? I don't want to wear spandex or hi/low blouses/tunics. I feel like I (and people like me.) aren't being represented in the stores right now. Off my soapbox now. I LOVE linen so I went to the store and looked at the linen fabric. They only had a few options that were not solid colors. 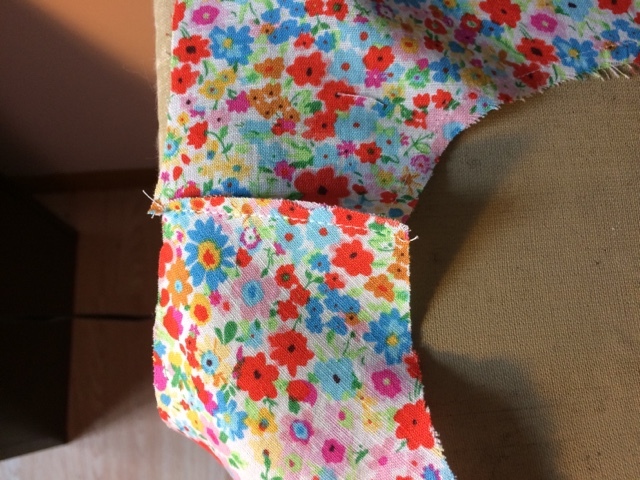 I saw this floral print that was mostly red and I bought a bit more than I needed so I could make something else with the "scraps" later. Since red is a central color in my capsule wardrobe I thought this would fit right in with my Spring capsule. I enjoyed making this dress and I enjoy wearing it too. It is perfect for these warm spring days. I used New look 6224 for this dress. 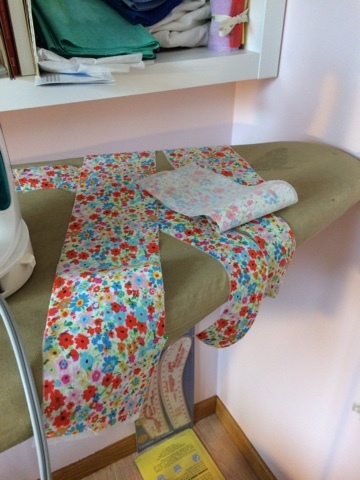 I made the muslin and after checking fit I cut out the fabric. Here it is on my cutting table. I was doing some organizing too. You can see a photo of my parents and the current quilt I'm working on as well under the dress. Sewed the whole thing on my featherweight 1947! Finally I tried (in desperation) to sew the facings on upside down. SERIOUSLY!?! UGH, the person who wrote this pattern should be fired. It makes absolutely NO sense. They call it a facing, but it's not sewn on like a facing at all. It's a neck band and they should simply call it that from the get go. It might make it a bit easier and not associate it with a facing in my mind. I actually wrote on my pattern directions, something I NEVER do btw, to sew the facings upside down. Because that's the only thing that works when sewing this dress. 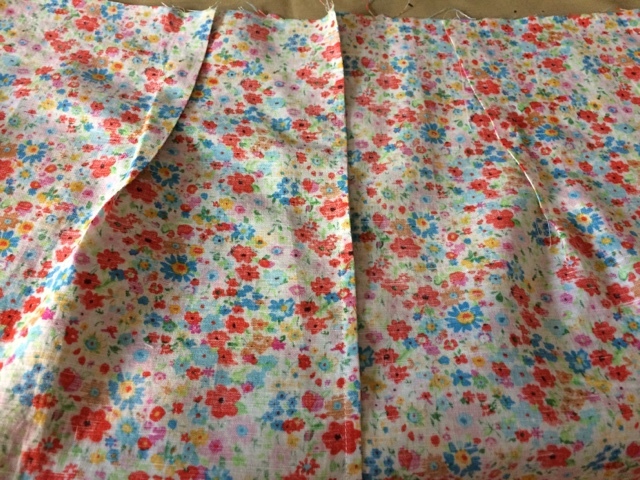 Now in cutting out my main fabric I realize that I would really like to have some pattern weights and a huge cutting table. But, I do not have room for a huge cutting table. Guess, I will just keep using the floor. But, a lady can dream, right? Close fitting bodice on dress with 3 different sleeve variations and 3 different neckline variations. 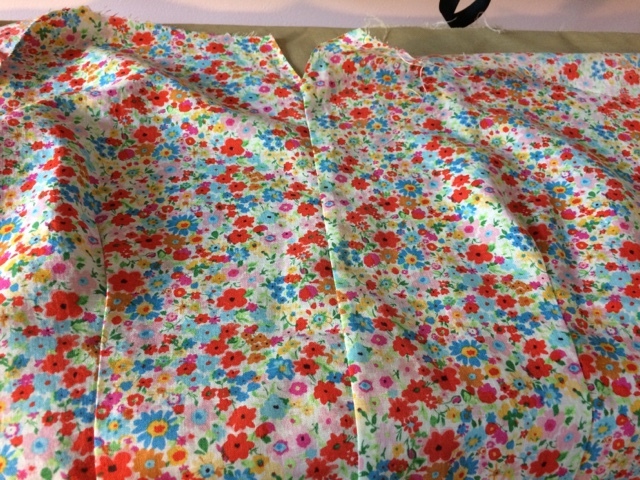 Full skirt portion is cut on the bias. 10 - 22. I sewed a size 22. Instructions were very easy to follow, other than said neck facing. I like the gathers instead of bust darts, they are easier to adjust for a larger bust.I normally have to do a FBA on commercial patterns. I love the skirt part and the larger neck line gives it an interesting look. The sleeves are cute too. Since I live in MN I need something that I can layer if it gets cooler. 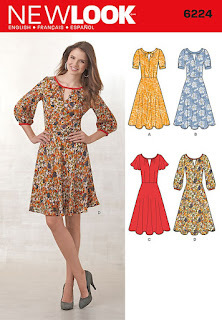 I love the flutter sleeves, but it just isn't practical for me. I made a muslin to test fit and struggled with the neck. Every review or blog post I've read about this pattern either glosses over the neck part or they made the view with the smaller neck. Yes - it's a comfortable dress with a nice, flowing, feminine touch to it. Although, I doubt I will actually sew another one. Conclusion: I really like wearing this dress and it is so comfortable. I actually made it with the zipper, but with the ease in the dress I don't feel like I need it. So, I'm going to be taking it out soon. I did french seams on the edges because linen has a tendency to fray and I want this dress to last a long time since I love it so much! Here is how I did the french seams. 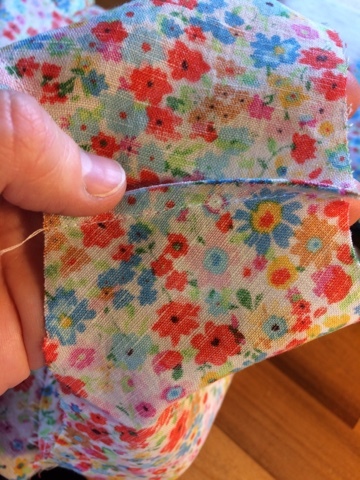 They are such an easy way to enclose seams. It's probably my favorite way to enclose seams. And since linen is one of my favorite fabrics this makes sense. 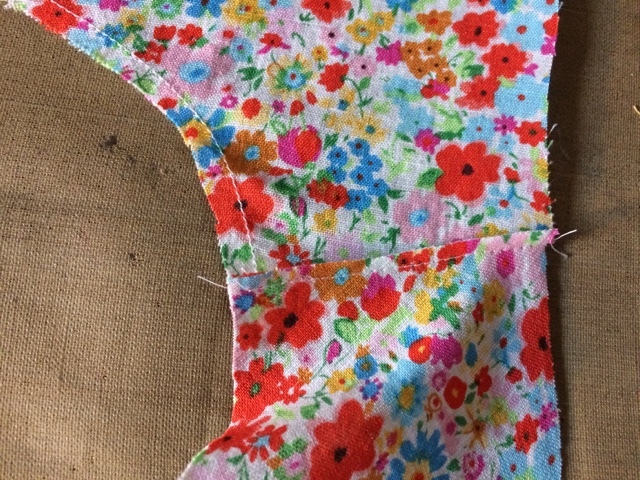 First, since the seam allowences were 3/8" I sewed a 1/4" seam with the wrong sides together. Then I ironed it down. I flipped the fabric to right sides together and ironed the other side open. I then sewed the right sides together at a 1/4" seam. 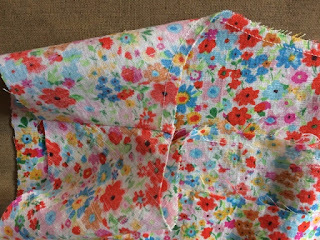 Which I know is actually 1/2" seam total, but it was easier for me to do. A few finished pictures of the dress. The linen does make the dress a bit less structured, but I like it. I know the black belt looks odd, but I was wearing black shoes too. For whatever reason my DH did not get that in the photo. "Ditch the suit. Hang up the fancy dress and the desire to impress. This Easter, you'll buy a t-shirt from a charity. Any charity. You'll wear your t-shirt Easter Sunday. You'll tell everyone about the charity you're supporting. That charity you bought the shirt from? Drill a clean water well. Rescue a slave from human trafficking. Employ a widow or single mother. Provide medical care for the sick. Share the good news of Christ." I was sitting on my couch thinking about all I have accomplished in the (almost) 4 years we have been here. I thought I would write it up so I could remember it all when I've been here 20 years or more. 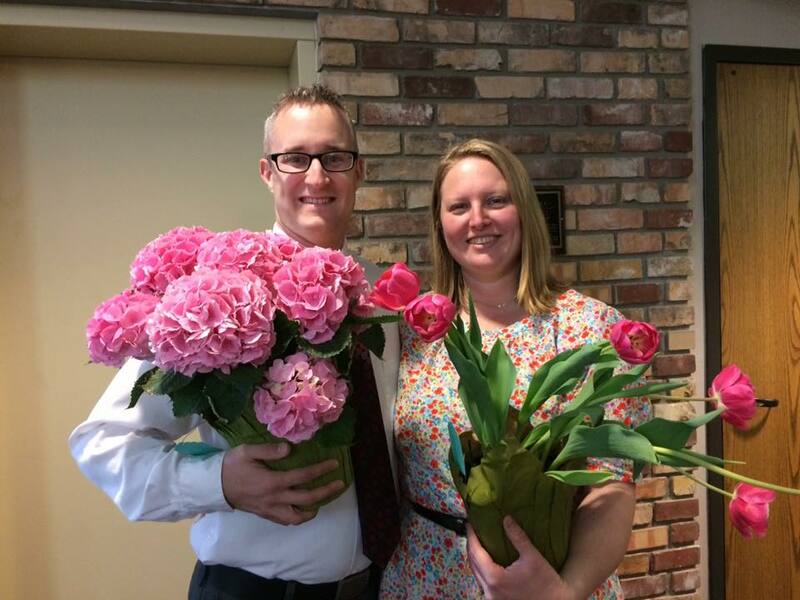 Feb 2014- We bought our place before we got married (scary!) and nothing was here except the house. Thank God for that at least. Basement was unfinished though and we had only 1 bathroom. June 2014- I moved in after we were married. DH lived in the house alone and without any furniture. 2015- I bought our first Silver Fox rabbits and slaughtered the last of the dutch rabbits. I expanded the gardens and fenced it in to keep deer out. I also planted a few apple trees. I had 1 hen gifted to me and several roosters though all the roosters were eaten. 2016- I started building a chicken coop after I ordered my Dominique chicks. We had some adolescent ducks gifted to us. I bought 3 more of the same breed and all turned out to be male except 1 and one died. (le sigh) Planted 1/3 of my large garden with strawberries the rest with annual vegetables.Always adding compost to the garden soil. Planted 2 plum(Toka and Black ice), 2 pear(Patten and Parker) and 1 apricot trees. Cleaned up a lot more of the property, since we have been maintaining more and more each year. Started stacking wood for later use. Started a chicken run to be finished in 2017. 2017- Finished chicken run, built a duck run and new duck house, built perennial raised beds and planted my regular gardens again. Always adding compost to make the soil better. Planted more resistant apple trees(duchess of oldenburg, wolf river, haralson, and ?) because the others died last year. And there is still so much more to be done for 2017. Some of this is just planned for 2017. I got a little overboard, but I am concentrating on finishing up things that we had started last year for 2017. Not too many new projects, other than the duck pens and house that should have been done last year. I've decided to let go of a few more of my pieces. But at the same time I want to finish and have more me made things in my wardrobe that fits and flatters my body. I've resolved to a few new sewing rules for 2017. 1. 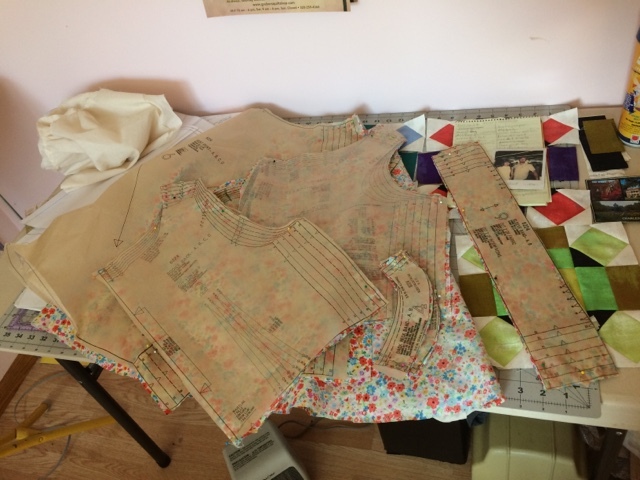 Sew a seamwork (I explain this at the end of this post) pattern every month to completion. They are supposed to take 1-3 hours to do, unless you add steps like I always do. Even still I think I can do this as they are all pretty simple. Getting the fit right with a muslin will be the longest step for me. 3. Finish up a quilt that is already started. I have at least 5-6 of these and maybe it will be more like get something finished on them. Quilts are larger projects and if I give 2 months to each I can still get my backlog finished and be snuggling under them for Christmas 2017. 4. Plan, shop and begin on handmade Christmas presents for one person each month. I'm still working on this list, but I know I need to keep it reasonable. For example, for my husband's niece I was thinking of making her a makeup bag and buying her some brushes and a few staple pieces. So far I have written down all the things I have unfinished in my sewing room and have tried to put them all together so I can just grab it off my new sewing rack and start working on it. I know that this seems like a lot to do, but I am considering this my stretch goal. I also have homesteading chores and lots of gardening to do. I feel like this number is OK. I always have more than I use in a week, but if I don't get to the laundry one week (rarely happens) then I'm still going to have underwear. There are a few lacy ones that I don't really like to wear because they are polyester lace and itchy. I need to get them out of there. I just ordered a few new pieces from pact. I'm hoping to replace all my undies with these now or make some. We will see how that goes. A lot of these socks are from when I lived in SC so I have so many pairs of thin summer socks, which I don't really even wear that often up here. Maybe I should just let them go so that drawer isn't so packed. Or maybe I could combine it with my leggings. I use these occasionally and I feel it's a good number. I have one full slip, one skirt only and one camisole. Both of these are going to wear out this year probably and will find their way to the trash. So, nothing to worry about here. These all fit nicely in a shoe box that I have in my sock drawer, but I don't wear them often as I have better things to keep me warm and in the summer I'm in the garden most of the time. Again...maybe I should be more ruthless with these. I released the cotton long johns that don't actually keep me warm in the tundra that I live in. Released 2 tops and 1 bottom. one of these is wearing out and in need of replacement. I would like to loose a bit more weight around my middle, but wishful thinking won't do it. I won another t-shirt on new years. I made 2 Sorbetto tops. Then on vacation I got something on a mint blouse (black of course and it's not coming out...) I bought a short sleeve spring knit top and a black velvet top to go out in. These are always worn under a shirt for modesty or warmth. I LOVE wool things and cashmere so I have invested in a few (too many?) sweaters. I might be willing to let a few go though that don't match the direction my closet is going or are too thin to bother with up here. Most of the thin ones are not wool or cashmere anyways. These are great for layering. I think I have a bit of crossover in the pink section of my closet and I could figure out which one to keep. I do have plans to make a pair of leggings to replace a pair that I wore a hole through in the thigh(nobody knows it's there 'sept me and Jesus...and now you.) and one more pair in addition. Most of these I wasn't sure whether to put them in the thermals bottoms section or here. I wear them pretty much the same. I only have 1 pair of thermals that are only over pants because they have odd seams on the sides. I bought a new pair of dark red leggings from pact as well. I'm hoping to receive them in the mail anyday now. When they come I will toss the ripped pair. Maybe I should just do that now? You can see that I don't think leggings are pants. I do not wear them alone. For me, it's a modesty and comfort issue. A pair ripped on vacation, I am going to try to patch them. Why do my things always get holes in the thighs? And I bought a pair of carharts on sale to work in. Not sure why I have so many of these as I don't really wear them that often. Most of them were packed away and are, like the dresses, light gauzy material that is waiting for warmer days. I LOVE dresses when it's warm and I am still learning how to wear dresses in the cooler weather. A lot of these are sheer-like or silk and are strictly summer-wear. As my needs change I will release them to my closet or out of the house. I am acclimating more and more to the weather here. Right now this is a good number for me. I may require more later, but I will sew some when I need them. I actually forgot all about this. Its a wool roving vest that I used to wear to the office. Its a bit fancy for anything I would wear now. I may have to let it go or start wearing it again. I have 2 blanket scarves and I love those. You can wear them in so many ways. I never got that whole infinity scarf thing, but I'm not a huge scarf person. I keep trying to make it happen because I see fashion bloggers talking about how it can "draw your outfit together." I only remember to grab one when it's cold outside and it stays with my coat most of the time-unless it's chilly indoors too. Which makes me think why do I have so many of these? I seem to wear one in particular over and over and over and...well you get the picture. Yet, I have 7 more? One only goes with one dress. And I can't remember the last time I wore that dress. Maybe I should get it out and spin. I made it to go swing dancing with my husband (then BF) and it's fun, but we have no where to go dancing up here. Strangely enough I could probably get rid of a few of these, but I won't/don't want to do that. Seems like they hide from me when I'm looking for them, but really I wear the same one all the time. It is starting to get a bit thin. I doesn't help that my #declutterdog ate the little ball of one of my hats last year. Most All except one of these are winter hats/caps. Purses-4 no change yet, I plan to make one for 2017 though. 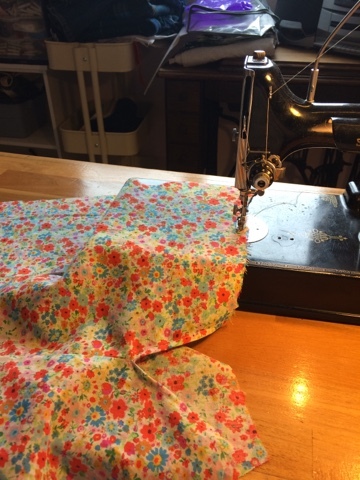 How do I figure out what I want to sew for the next year? 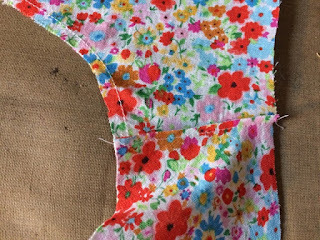 (OR what is Seamwork?) I am a subscriber to seamwork by Colette. For 2017 I plan (ha ha) on more time sewing and less time planning and dreaming. Even though I'm great at planning and dreaming! My stretch goal is to have an entirely me made wardrobe. I started with the basic pieces like tanks and I'm investigating undies. I'm not sure if I'm ready to tackle bras yet, but maybe by the time I wear out the ones I have I will be ready! They even have one on the seamwork patterns selection! Even though I'm not crazy about the back I think it would be a great exercise in starting to make my own bras. I feel so invigorated after my vacation. Almost 2 weeks of not having to do my regular things! We mostly spent time with family and some old friends. We went out occasionally, but really it was just a visiting vacation. My Mom and I talked a lot about homesteading stuff and both of us bought a copy of a book that mother earth put out called 'Self-reliance and country skills.' There are quite a few cool articles in there and I'm really excited for spring now. While I was in SC it was like spring to me. The daffodils were blooming and things were starting to bud out. As we drove back up the MN it got colder (also, because it was getting dark because it was turning into night.) and it felt more and more like winter. We woke up the next day and it is now 57 degrees and sunny outside. I decided to get into my bees and make sure they were doing well. I am a really successful beekeeper so far! I bought 2 packages of bees and caught a swarm on my first year! The ones I caught did not make it through the winter because they didn't have enough food to make it and one of my packages didn't make it because the hive was tilted backwards and I think they got too much water inside. There were puddles of water on the bottom and there was a bit of mold on the top cover. So, it could have been mold that did it too from the water, but I'm not sure. Cleaning them all out was sure a job! But I feel better knowing that one of my hives has made it through a whole year and we are going to get more delicious honey. Even though I made my husband ration it all out because I planned on feeding the bees their honey back in the spring if they were still alive. I actually just moved the frames with honey still in them to the hive that was alive. All in all I learned a lot about bees this year. And I'm really eager to see what this new year brings. I like to celebrate the new year 3 times a year. January 1st, Chinese new year, and (my favorite) the dawning of spring.